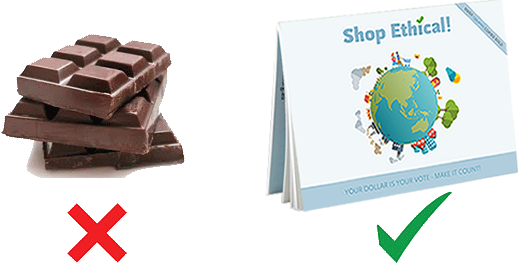 Chocolate is commonly sold as a fundraiser by schools, community groups, and in workplaces. Chocolate is high in sugar and fat. 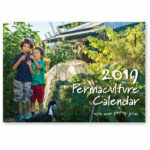 Would you like to raise funds for your school, church or workplace while raising awareness about the issues connected to our everyday purchases? Please call us on 0481 502 057 if you have any questions. Free display stands and promotional posters available. 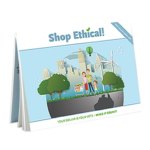 Instead of selling individually packaged questionable chocolates to fundraise for the McCrae SUFM program, this year we decided to order 80 copies of the Ethical Supermarket Shopping Guide to sell in our local churches. It didn’t take too long before they were all gone! And it’s done better than a fundraiser – people have really taken on board the ethical shopping challenge and I know of cases where favourite brands have been dismissed because of a poor rating in the guide. For some great resources for use in schools see Go ethical in your school.